More videos and photos hup!!!! It’s great to finally get around to posting some more photos and videos on the website. Mr Crawford landing in town last week was a real highlight and we managed to fit in a night at my pad catching up and I even got around to servicing his instruments the next day. I took the opportunity to snap a few photos and videos which I’ll post up in the sound room and photo pages. Kev’s playing is at another level – just amazing and it was brilliant to be with him watching him produce his magic. Even just testing the instrument after a service was to hear him produce works of art. Check out the tune that he says “he doesn’t really play”. He was testing the flute for response ….. truly incredible. I’m really looking forward to spending a couple more days with him and the lads this coming weekend at Port Arlington Celtic Festival. There’s not always a lot happening on my news page but when it does it’s packed full of great stuff – some very exciting videos in this edition. Check these out – you won’t be disappointed!!!!! Xos’e is an amazing flute player from Galicia. I met him years ago when he ordered an instrument and heard him play. I love his playing so I ask him to do a little video for the website. You don’t hear him enough on the flute because all the bands he plays with in Galicia want him to play bouzouki. Thankfully a flute album is on its way ….yahoooo! It will be on here when it does!! Calum’s a very talented piper and whistle player from Scotland and now living in France. I love the energy in his playing. He recently ordered a low D whistle from me and I asked him to put down a video…..we are so lucky – he did two! ENJOY!!!!!!! DOUGAL ADAMS & JOHN MEREDITH. Two absolute gentlemen and really great flute players from Melbourne playing together. Dougal is using my later design flute and John the earlier design. They are incredibly sensitive and musical players and I love their music. Hopefully we’ll get a little individual piece from each of them soon. BRID O’GORMAN with EOIN O’NEILL. 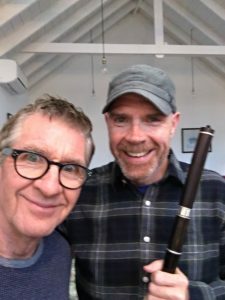 Neither of these musicians really need an introduction – they are well known around Co Clare and beyond. Brid’s playing is absolutely fabulous and the power and tone she gets from the flute is incredible. Check out her new album “Bluebells are Blooming” – you won’t be disappointed. Here they’re doing a little piece for Custy’s music shop to promote the album. Thanks so much to all you guys for contributing to the website. I’m really blessed to have such wonderful players around me where ever I go. THANK YOU!!! Copyright © 2019 Grinter Flutes. All rights reserved. | Website by Greengraphics.